No one is ever too old to look after the health of their skin. In fact, healthy skin may be even more important as a person ages because of changes that make skin more fragile. Skin becomes thinner with age and loses some fat, making it bruise and break more easily. Bruises, of course, are painful and breaks in the skin can result in infections. Therefore, there is every reason to ensure an older adult’s skin stays as healthy as possible. Since November is National Healthy Skin Month, we’re sharing 4 ways you can help your older family member to achieve healthier skin. 1. Have Regular Skin Exams. The chances of developing skin cancer increase with age. However, when skin cancer is caught early, it is highly treatable. Often the only treatment needed is removal of the cancerous cells. When it is not discovered until later stages, it is not as easy to treat. Check skin monthly for changes in moles or abnormal spots. 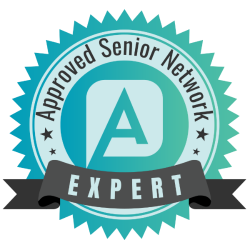 The senior should have a professional exam by a doctor at least yearly. Home care providers can help seniors to check their skin each month, looking at their back, legs, or other areas that may be hard for them to see. Dry skin is uncomfortable and itchy. Scratching can cause skin to break open. To prevent dry skin, the senior should use moisturizers. It’s also important that they stay hydrated by drinking plenty of liquids throughout the day. Also, warm water instead of hot should be used for bathing since hot water is drying. Home care providers can assist the senior to apply moisturizers daily, especially to hard-to-reach areas like lower legs and feet. Like the rest of the body, skin needs nutrients to remain healthy. Eating a balanced diet can ensure the skin gets all of the nutrients it needs. Older adults should eat a wide variety of vegetables and fruits, whole grains, lean proteins, and low-fat dairy. Home care providers can prepare healthy meals for your aging relative that conform to their special dietary needs while also providing the necessary nutrients. 4. Protect Skin from the Sun. Seniors need to use sunscreen to prevent skin cancer. In addition, protecting skin from the sun also helps keep it from becoming damaged and dry. In addition to using a sunscreen with an SPF of 30 or higher, older adults should seek out shady spots to sit and wear clothing that protects the skin. Home care providers can assist older adults to apply sunscreen and remind them to reapply it throughout the day. They can also help seniors find shady places to sit and assist them with choosing clothing that will keep them cool, but still keep skin safe from the sun’s rays. If you or an aging loved one are considering home care in Lake Forest, IL, contact the caring staff at Companion Services of America today at (847) 943-3786. Our home care service area includes Northbrook, Highland Park, Deerfield, Glenview, Buffalo Grove, Evanston, Des Plaines, Skokie, Lake Forest, Wilmette and the surrounding areas.